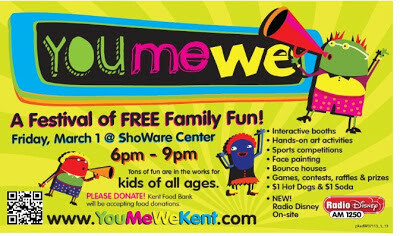 A festival of free family fun coming to ShoWare March 1, 2013, 6pm-9pm. Local Kent talent, 40 interactive booths showcasing various Kent youth/teen resources, hands-on art projects, bounce houses, Disney radio on site and family friendly prices for concessions. This is super fun for smaller Kids, we took our daughter 2 years ago and she loved it!